Are tattoos an ancient form of art expression, or do they signify a rite of passage that proclaims a person’s identity, or both? I have often questioned the reasons why a person chooses to get a particular tattoo and how they determine where it will be permanently etched into their skin. I must admit that I no longer have these questions because I have answered it for myself. Several years ago I flipped through pages and pages of Pinterest tattoo designs until I found the one I wanted to wear forever. The trouble is, I only had enough courage to draw the design onto the top of my foot using a black sharpie pen. My longing for the design never did fade. I loved the design so much that I even drew it on the tops of my children’s feet and we took a picture to keep as a reminder of our treasured art. Fast forward about six years and my sixteen-year old daughter accompanies me downtown to find the artist who will take on the task to transform the skin I was born with. My heart was racing and worry was running through my mind. What if I do this and change my mind? There would be no turning back once the needle pierced my skin. All I could think about was the life sentence of regret I would have to serve if I changed my mind after the procedure was completed in a time span of less than twenty minutes. My daughter assured me that I had given birth to three children so the pain would pale in comparison. I sure hoped she was right. 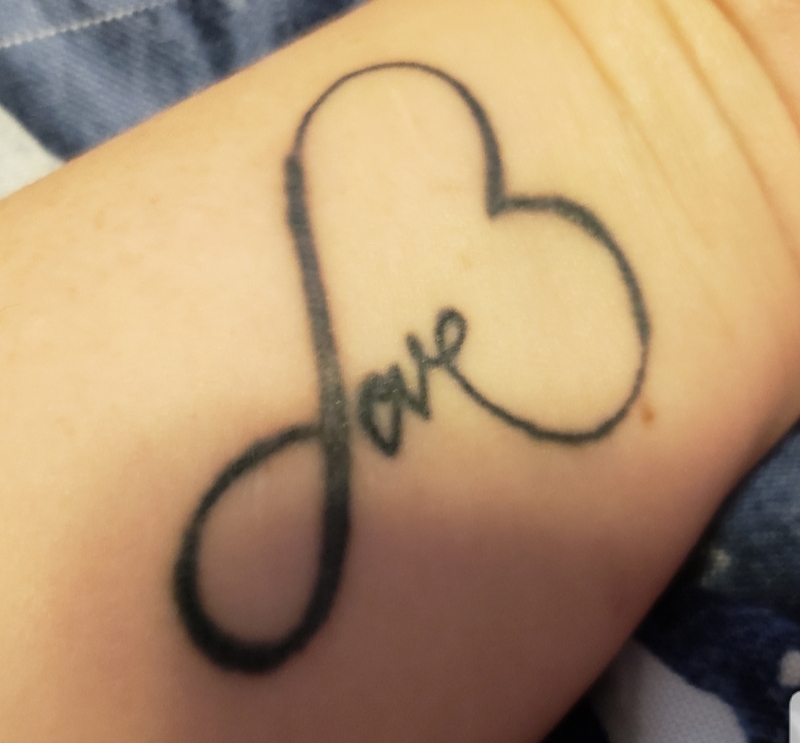 I had chosen to get a tattoo of the word “love” inscribed as an infinity heart because all I have ever truly wanted in life is to be loved and to give love to those who need it even more than me. I thought about the placement and two considerations came to mind; the amount of pain tolerance I was willing to bear and where it could be viewed for all to see when I wanted to express my love and at the same time partially hidden if I chose not to expose myself to judgement. I chose the left underside of my wrist to align with the left side of my body where my heart and wedding ring hand reside. The timing of when I got my tattoo was significant. I had been experiencing a tumultuous, continuous cycle of anxiety and depression and I just wanted to feel peace and comfort with the external world. I had an overwhelming desire to fit in and wanted so desperately to be surrounded with people who I could relate to and who get me better than I do. All I knew is that it would be harder to judge someone with the word love tattooed on their skin. So many people clearly need to feel valued and cared for. My tattoo would be a piece of beautiful artwork that I could use to express to the people around me that we are all worthy of giving and receiving love. I will honestly tell you that I have no regrets now that it is done. I am happy and proud to wear a visual reminder that signifies to myself and others that we all have the ability to endure physical and emotional pain and that we each carry the strength inside us to move beyond broken and be loved. Beta Reader for Paul Carney, author of "Move your Ash". The Barber that became a Superhero Overnight to all the Balding Scalps of the World.